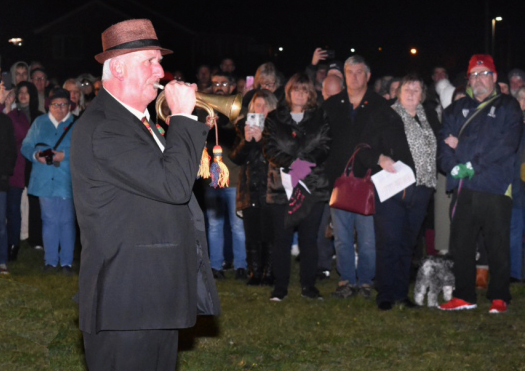 A clifftop ceremony commemorating the 100th anniversary of the ending of the First World War attracted a fine turnout as a “very moving” community event was held. An estimated crowd of more than 500 people turned out on Pakefield Cliffs on Sunday, November 11. 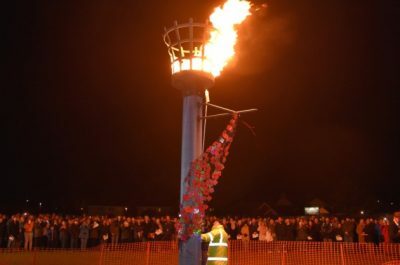 Those present saw the beacon lit as the bells tolled to remember the war dead and to mark 100 years since the Armistice was signed. Rev Sharon Lord, vicar of Pakefield, led the proceedings. She said: “It was a very moving and poignant occasion with stories, songs and reflection. “The community did us proud, coming out in their droves to support the event. The church was full prior to the start for a time of reflection and it was heartwarming to see everyone standing around the beacon. Rev Lord added: “We remembered that the community of Pakefield likely stood on the same cliffs 100 years ago, thanking God that the war was over, but also in grief for all those who had been killed. “Then children read stories of local people involved in the First World War and everyone joined in the singing of wartime songs. Afterwards several people said how singing the songs brought back memories of hearing them from their parents or grandparents. “But the most moving part of occasion for me was to see 42 people come forward to read the names of those from Pakefield who had died. Posted in Academy news on 12th November 2018.